DESPITE BEING A new phenomenon among Irish consumers, Black Friday has already shifted shoppers’ spending habits. New figures from Retail Excellence Ireland (REI) show a general uplift in most sectors, despite momentum tailing off in the aftermath of Black Friday and weather hampering footfall in city centres nationwide. REI head of communications Lynn Drumgoole said there was already a trend emerging of Irish shoppers prioritising Black Friday sales over traditional gift-buying periods and post-Christmas sales. “It is clear that the Black Friday phenomenon is having a significant impact across many sectors and especially in consumer electronics where there was strong growth across the quarter,” she said. However Black Friday led to a quieter October as consumers postpone spending, and a weaker post Christmas sales period. 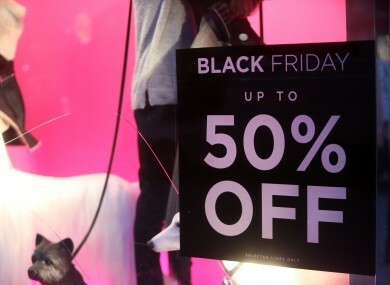 Traditionally a popular event in the United States, Black Friday has become a global affair in recent years as shoppers flock to the stores on the day after Thanksgiving to snap up discount goods as part of the flash sale. Last year saw a number of Irish retailers attempt to replicate the experience. In Longford Town, the local chamber of commerce coordinated 65 local businesses who teamed up to offer a range of discounts in order to encourage footfall on the day. Speaking to TheJournal.ie, Cork Business Association chief executive Lawrence Owens said that despite the mixed reviews of Black Friday, it was positive for businesses in general. “There was definitely a greater willingness to spend this Christmas period and only for the weather it could have been even better,” he said. I would say some Cork retailers may have been a bit behind in terms of the trend. It looks like Christmas trade will begin a bit earlier from now on and this will be important for our members who are worrying about reductions in their margins. Email “It's official: Black Friday is destroying the December sales”. Feedback on “It's official: Black Friday is destroying the December sales”.